The big Rokkaku comes to mind on just about any light wind day. But if there's any rising air about at all, this kite always serves up a treat of thermal flying! At other times, often late in the afternoon, it will just hang up there in the lightest of breezes, steady and smooth. Nice. Many people will have seen a Rok or 3 at a kite festival. But rarely anywhere else! So it's something different. *** A kite with twice the span and 4 times the sail area of the Dowel Rokkaku. 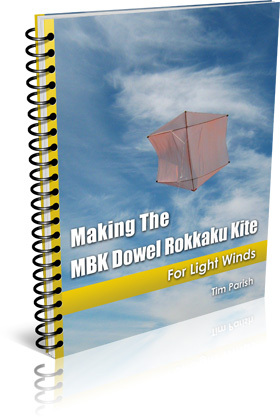 *** When de-rigged and packed down, this kite is the same length as the Dowel Rokkaku package!